To Keep or Cut? Taking a Closer Look at Tree Maintenance. Trees can be a commanding feature of any property. Beyond their aesthetic appeal, trees play an important role in the environment; providing shade, forming windbreaks, and intercepting storm water runoff. Additionally, they can offer privacy from neighbors, provide a home for wildlife, and increase the value of the property. Unfortunately, trees can also pose a risk to your personal safety and the safety of your property. When you consider those dangers, you might be faced with some difficult decisions on whether to keep or cut your trees. 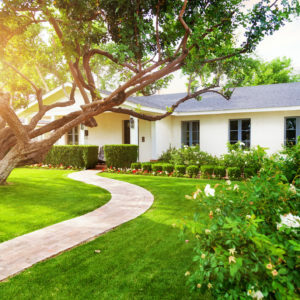 The good news is, if you chose to keep your trees, proper tree maintenance can help reduce those risks and keep your trees healthy. Sick trees become weak, lack environmental benefits, and lead to increased hazards. Keep tree branches trimmed so they are at least six feet from any structure. Remember, before you trim or cut down a tree, make sure it’s on your property. If you’re unsure, your deed should have property lines included, if not, you can check with your town or city hall and talk with your neighbors. According to the National Storm Damage Center, tree damage due to severe weather can cause more than a billion dollars in losses per year. That damage can include broken trees, fallen branches, and even completely uprooted trees. Any of those can impact your roof, siding, power lines, decks, fencing, sheds, and other structures. A tree on your property could even fall onto your neighbor’s property causing damage there. Storms aside, tree roots themselves can wreak havoc on underground pipes, retaining walls, foundations, walkways, and driveways as they grow. The roots can also attract insects such as carpenter ants or termites which can then start to colonize within your home or building, so keep an eye on the roots as they spread and make sure there’s a safe parameter around them. Incorporating trees into your landscape or property can be challenging, however, they are an important resource and part of the environment. We hope these tips will help you ensure the health of your trees and help you protect your piece of the world!